Recently while wandering about in Etsy (in a cyber sense), I found a shop that sell wine holders for spinning wheels. I immediately wanted one of course, given that I have recently learned to make wine and I love spinning it seemed a perfect match. I know it’s not a wine glass, but one would fit in the holder. That started me thinking about matching wines to fibre types. We match wine to our meals, why not other sensory feasts? I thought about it for a while and came up with the following list. 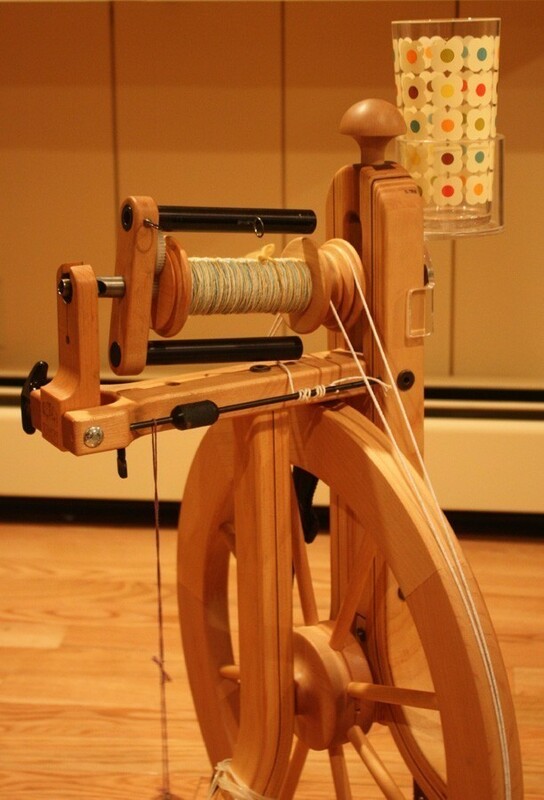 You may find it useful if you purchase one of those wine glass holder things for your spinning wheel. Chardonnay– One of the most common white wines, chardonnay should taste oaky, fruity and have a velvety feel in the mouth. This sounds like good old merino to me. Match your chardonnay glass with some hand dyed merino tops for spinning and you have the perfect spinning binge. Pinot noir- This is a light red wine which is fairly common, it should be high acid, low tannin and taste of fruits and roses. One of it’s defining characteristics is it is hard to make and is very easy to get wrong. This one sounds like cotton to me; both are difficult to get right and require exacting concentration. Spin up some naturally coloured cotton with a glass of pinot noir and see if I’m right. Shiraz- This is one of the strong flavoured red wines, it should taste of peppers, cherries and maybe chocolate. It is known as a very long lasting wine as it remains stable and drinkable in a wide variety of conditions. Because it is such a strong, opinionated wine I think it would go well with border Leicester wool as both are strong, hard wearing and lustrous. Riesling- This light flavoured white wine should taste of fruit and be generally sweet. Riesling is a high acid white wine making it long lasting, meaning it can be aged for a long time and still be drinkable. This quality makes me think of flax which is spun into the long lasting linen yarn. Linen also improves with age and is both sweet and crisp. Cabernet Sauvignon- This strong flavoured, high alcohol wine is one of the most common reds around, it should taste of vanilla and red currants. It is a very long lived wine and can be aged for centuries. This wine pairs very well with Lincoln longwool fleece which can also last for centuries in the right conditions. Grab a bottle of cab’ sav’ and some lincoln longwool fleece and get spinning. Merlot- This (relatively) light flavoured red wine is said to have a plum and herb aftertaste. It’s low tannin makes it easy and soft to drink. This softness makes me think of silks. Sit down to spin some silk tops with a nice glass of merlot. This is not a complete list of course, there are so many wine types and so many fibre types it could turn into a book, don’t even get me started on blends (both wine and fibre). Can you add a wine-fibre pairing to the list?